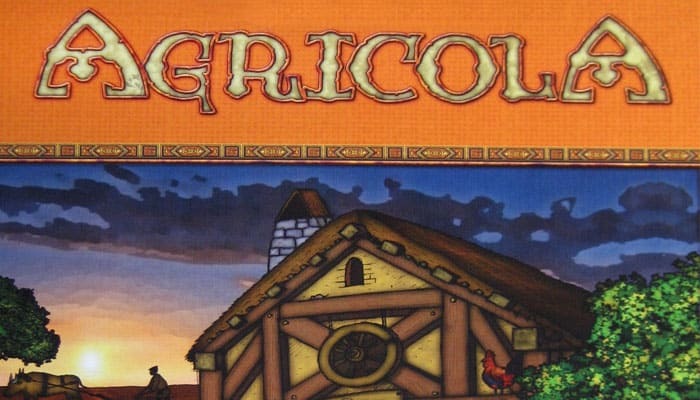 Players start the game with a farming couple living in a simple two-roomed hut. During the course of the game, these families have abundant possibilities to improve their quality of life by building up their home, improving their fields and breeding their animals. In each of the game's 14 rounds, each of a player's Family members may take exactly one action. They can generate building resources such as Wood and Clay, add more people to their family, and ensure that they are fed. In each round, each action can only be taken by one Person - players will miss out if another player chooses the action first. A new action becomes available in each round - see Overview of game phases. You must plan to grow your family at the right time - but not too soon, because even the next generation must be fed. Growing your family is important, though, because it allows you to take more actions as they become available. At the end of the game, the winner is the player who has established the best farmyard. Victory points are awarded for the number of fields, pastures and fenced stables, as well as for Grain, Vegetables, Sheep, Wild boar and Cattle. 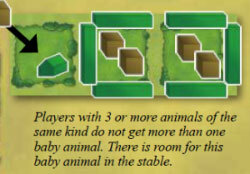 Players lose one point for each unused farmyard space. Additional points are awarded for extension and renovation of the family's home, for the number of Family members, and for played Occupation and Improvement cards. There are examples of play, with explanations, on the reverse sides of three of the boards. Place the three game boards as shown in the illustration to the right. Each player chooses a color and takes the playing pieces in that color, as well as one farmyard. These are placed in front of the player (facing whichever direction the player chooses). On each of the two building spaces on this farmyard, players first place a Wooden hut room tile and then (in each of these rooms) one of their Family members. The remaining playing pieces (additional Family members, fences and stables) remain in the bag for now or are placed to one side. Sort the remaining house and hut tiles and the rest of the game components and place them beside the playing area. Sort the cards according to the color of the reverse side. Depending on the number of players, different green Action cards (B) are used. There are also blue Round cards (A), yellow Occupation cards (C), orange "Minor Improvement" cards (D), red "Major Improvement" cards (E), grey Begging cards (F)) and Summary cards (G). Sort the blue Round cards according to the Stage of the game. Shuffle each small pile and place the piles on top of each other with the cards for Stage 6 at the bottom, Stage 5 on top of that, etc - finishing with the four cards for Stage 1 on the top. The Round cards make new actions available during the game. If you are playing with 3, 4 or 5 players, take the corresponding set of green Action cards and place them face up on the spaces to the left of the first game board. The order in which the cards are laid out is irrelevant. In a 3-player game, there are 4 cards, in 4- and 5-player games there are 6 cards. In solo and 2-player games, no green Action cards are used. The purple symbol on the left side of the yellow Occupation cards shows how many players the card is used for: means for 1-5 players, for 3-5 players, for 4-5 players. Cards that are not in use are removed from the game; the full deck of Occupation cards is only available in a 4- or 5-player game. Shuffle the cards. Each player is dealt a hand of 7 Occupation cards and may look through them. The remaining Occupation cards are put to one side. Shuffle the orange Minor Improvement cards. Each player is dealt a hand of 7 Minor Improvement cards and may look through them. The remaining Minor Improvement cards are put to one side. Place the 10 red Major Improvement cards face up on the Major Improvements board. As soon as 9 Major Improvements have been bought, the board is turned over to show the scoring overview and the remaining Major Improvement is placed on the space on the reverse of the board. Place the grey Begging cards face-up beside the playing area. Each player takes a Summary card and places it in their playing area. One side of the card gives an overview of the game phases; the other explains the scoring at the end of the game. There are no scoring rounds during the game. Players choose a starting player who receives the Starting player marker and 2 Food. The other players each receive 3 Food. The Starting player marker is not automatically passed on to the next player at the end of a round: it passes to the player who chooses the "Starting player" action. The game consists of six stages, which are divided into 14 rounds. Each round follows the same pattern and consists of four phases. There is a Harvest at the end of each stage (after rounds 4, 7, 9, 11, 13 and 14). This is shown on the game boards as Harvest. Turn over the top Round card and place it on the appropriate space on the board. The action on this card is available to all players, and can be used not only in this round but in all subsequent rounds. All actions which occur at the beginning of a particular round or at the beginning of every round occur now. The text on some cards instructs players to place items on the Round card spaces. If there are tiles, Food and/or other playing pieces on the space for the current round, these are distributed to the appropriate players (who earned them by playing an Occupation or Improvement). Place new goods and Food on any Action spaces on the board that require them (on the printed spaces as well as on Action and Round cards). These spaces are shown by an arrow. If goods or Food are already on a space, the new goods/Food are added to them. 3 Wood means that 3 Wood tokens are placed on that space each round, 1 Cattle means that 1 Cattle token is placed on the space each round, etc. The Fishing and Traveling Players Action spaces receive 1 Food each round. These goods and Food are taken from the general supply and can build up over several rounds - there is no upper limit. In clockwise order, starting with the Starting player, players take turns taking a single Family member from their farmyard, placing it on an unoccupied Action space and taking that action. Play continues until all Family members have been placed. A player may only ever place one Family member at a time. Each Action space can only be used by one Person in one round. A Family member may never occupy an Action space without performing its action. Some Action spaces offer players several choices of action or require a player to take one action before (optionally) taking a second action. 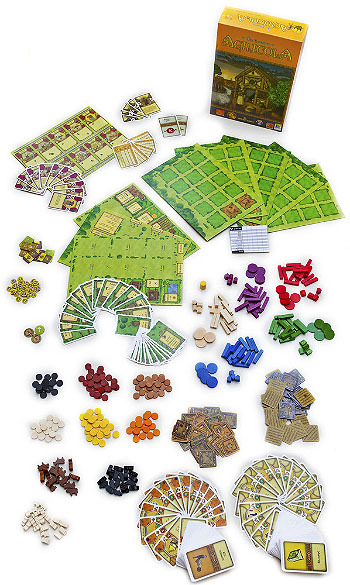 Whenever a player takes building resources, Grain, Vegetables or Food, the tokens are placed in a player's personal supply in view of the other players. Animals may not be placed in the supply; they must be placed directly into the farmyard. Animals that cannot be placed into the farmyard must be returned to the general supply or immediately transformed into Food using an Improvement with the cooking symbol. A player who plays a card from their hand or buys a Major Improvement must read the text on the card aloud so that all the other players are aware of its effects. Players are not allowed to hide their personal supply from other players or to completely cover cards that they have played. Players remove their Family members from the game boards and return them to their home. Players feed their Family members during the Harvest, which occurs at the end of each stage of the game (see Appendix, section 6) - that is, after rounds 4, 7, 9, 11, 13 and 14 . The Harvest consists of three phases, which occur one after another. 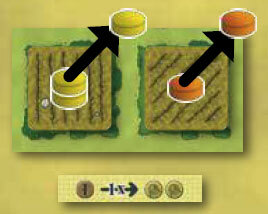 Players remove 1 Grain or Vegetable token from each Sown field in their farmyard and place them in their personal supply. Players may also receive additional Food from Occupation or Improvement cards that they have played. At the end of this phase, each player must feed his or her family by paying 2 Food per Family member. Offspring that were born during the current round ("Newborn offspring", typically from a Family growth action) only consume 1 Food for this round, but will require 2 Food in future Harvests. Each unprocessed Grain or Vegetable may be converted to 1 Food at any time. Fireplaces and Cooking Hearths, as well as other specific Occupations and Improvements, allow players to convert Vegetables at any time, at a better exchange rate. Improvements with the cooking symbol can be used to convert animals to Food at any time. Improvements with the bread symbol can be used to Bake bread, but only when the player takes a Bake bread action during a round. Unprocessed animals have no Food value. A player who cannot or does not wish to produce the required Food must take a Begging card for each missing Food - players may not give up members of their family to avoid the need to Feed them. At the end of the game, players lose 3 points for each Begging card. Lastly, any player with at least 2 animals of the same type receives exactly one additional (baby) animal of that type - but only if the lamb, the shoat (piglet) or the calf can be accommodated in the farmyard (or on an appropriate Improvement card, for example the "Animal Yard", "Wildlife Reserve" or "Forest Pasture"). Baby animals and parent animals may not be converted into Food immediately after the birth (for example, if you only have room for two animals of that type); they simply run away if they cannot be accommodated. The animals breed regardless of where the parent animals are placed. 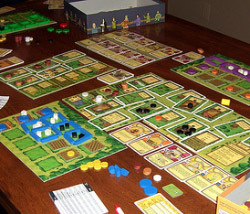 The game ends after the Harvest at the end of the 14th round (Stage 6), after which the player's scores are calculated. Tally each player's Victory Points on the scoring sheet. The player with the most points is the winner. 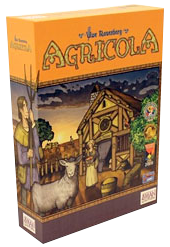 If there is a tie, the tied players share the victory (or can play another game of Agricola to break the tie).